It was a thick red cedar forest. The canopy was vast and spread like a green umbrella with juicy leaves. A number of caterpillars were living there. They moved from leaf to leaf fearless and free. One of them was special. His name was Bitee. From the day he was born, he looped, twisted and crawled as if in a hurry. He had strong legs and could walk faster. His friends could never keep pace with him. Not only in walking but also in appetite. Bitee had a ravenous appetite and looked hungry all the time. There was plenty of food, staple, balanced and junk all around. Bitee found the food tempting. He ate leaf after leaf, crawling swiftly from branch to branch. He would bite and chew hundreds of leaves, morning and evening, day and night without rest. With every junk food sliding into his throat, he grew large and fat. His friends laughed at him and nick named him, “Bitee, the Fatty”. Bitee was not bothered. He continued to enjoy his meal. But something was not alright for him. His legs were unable to support his body weight. He became slow. His grip became weak. One day he slipped and fell to the ground. It was an accident and Bitee was unprepared. The forest floor was littered with dry leaves. It was wet and stinky. And there were all kinds of creatures moving. Bitee had to escape every moment from being trampled upon. There were predators looking for a meal all the time. Bitee wanted to crawl back to the canopy. It was too high and Bitee was too fatty and slow. With his weak legs, he had doubts reaching to safety quick enough before being spotted and preyed upon. Bitee was gripped in fear. An idea flashed in his small brain. He began to spin a pupal case around him. The forest floor would never be safe even for a pupa or a cocoon. But Bitee had no other option. He hurriedly spun the cover and thought he would be safe. But no. Bitee was so big and fatty; his pupa had to be unusually large. As it was built hurriedly it had to be thin and unproductive. Besides, it was lying motionless and bare on the open floor. 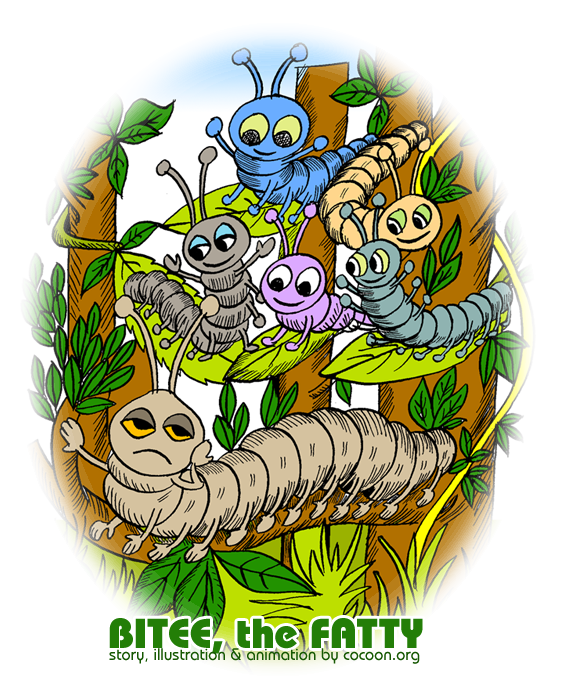 While Bitee’s friends were all settled in their cocoons, safely located and camouflaged in the canopy above, Bitee was lying on the floor, helpless. His hopes of developing into a free flying butterfly dwindled. One day, a hungry lizard came nearby. He sniffed, rolled the cocoon up and down. Bitee was absolutely frozen. Suddenly, something happened. A snake hissed at the lizard. The lizard fled. Bitee was saved. He had a sigh of relief. But this was how his winter sleep passed. It was unbearably too long one. Had Bitee stayed his usual size, with normal eating, the way his friends were, he would have enjoyed the winter sleep inside the pupal case. He had never controlled his eating habits and put his taste buds under check. He failed. He had to pay the price. Are you going to control your bad habits?